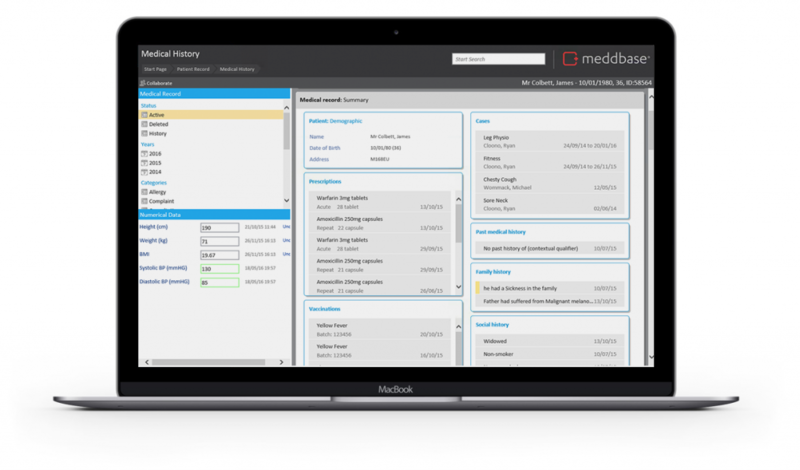 An Electronic Medical Record is created for each patient registered within the MedDBase Medical Software Application, and creates the basis for all patient-related data within the medical record. Patients are entered as individuals and can be linked to a company, for example an insurance company, employment company or legal firm, or to another patient, such as mother, father or next of kin. They can then be searched using a wide range of search parameters, for example by name, date of birth, company etc. You may also create your own custom fields within the medical record details allowing you to store and report against data specific to your medical practice or business. Subsequently, patient details can be viewed and modified throughout the database by Authorised Users. Medical Record details are stored for each patient and can be input in numeric or text format. All details are coded using our clinical coding system (for more details please see SNOMED Clinical Coding). These details include current and historic medication, allergies, vaccination history, examinations, tests and consultation attendances together with treatment history and surgical procedures. Numeric fields such as height, weight, glucose etc. can be displayed in a report or graphed over a period of time along with any numerical pathology results. Results, such as BMI, can be calculated automatically and can also be displayed in a report or graphed over a period of time. Additional bespoke fields not listed on the default Med+DBase medical record software details page can also be added in either format. Patient medical history is available for administration purposes, and can be accessed through the patient medical record with details of attendance and outstanding bills. Doctors can access the history of a patients medical record and view past appointments and consultations, along with additional family medical history and social notes. Aspects of the patient medical record can be restricted for access using our role-based security module if required. For further information about role-based security see medical record security.